COCOA BEACH, Florida -- Sierra Nevada Corporation (SNC) Space Systems announced its interest in Florida's Space Coast as a possible location for commercial human spaceflight programs and facilities. In attendance at the announcement at the Hilton in Cocoa Beach, Florida was Florida Lt. Governor Jennifer Carroll, Florida U.S. Senator Bill Nelson, Kennedy Space Center Director Bob Cabana, Space Florida President Frank DiBello, SNC's Space Systems Head Mark Sirangelo, Former Space Shuttle Astronaut Steve Lindsey, Economic Development Comission of Florida's Space Coast CEO Lynda Weatherman, and Brevard Work Force President Lisa Rice. SNC’s winged orbital crew vehicle, the Dream Chaser®, is in development with plans to launch on the United Launch Alliance Atlas V vehicle from Launch Complex-41 at Cape Canaveral Air Force Station in Florida. In addition to launch operations, SNC is interested in exploring landing, vehicle processing and other capabilities within the state. Space Florida and State and Local Officials met with SNC leadership today to discuss the potential for basing expanded Commercial Crew operations in Florida. One of the exceptional features of the Dream Chaser would be instant access to crew and cargo once the mini-shuttle lands because there are no hazardous materials associated with the spacecraft and vehicle re-entry would only experience a force one-and-a-half times that of Earth's gravity. The Dream Chaser is one of several projects competing for NASA contracts to ferry crew and cargo to the International Space Station. “Sierra Nevada Corporation’s interest in the Space Coast further illustrates our capacity to build on our heritage launch capabilities, emerging as a premier spacecraft assembly and R&D location. We are pleased to be a part of the project team working with Space Florida and Sierra Nevada Corporation to demonstrate the advantages of expanding the company’s commercial crew operation on the Space Coast,” said Lynda Weatherman, president & CEO of the Economic Development Commission of Florida’s Space Coast. U.S. 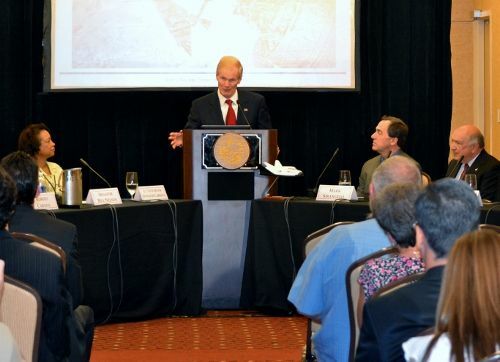 Senator Bill Nelson impressed upon the continued need to invest in space and cited the important work that is still ongoing aboard the International Space Station such as two research vaccines, one for MERSA and the other for Salmonella. SNC Space Systems, a Colorado-based designer and manufacturer of advanced spacecraft, space vehicles and spacecraft subsystems and components for commercial and government customers, was awarded two funded Space Act Agreements as part of NASA’s Commercial Crew Development Program in 2009 and 2011. SNC is considering a number of U.S. locations for its expanding commercial crew operations and currently awaits details of possible State incentive packages to determine if Florida will be the selected location for future commercial space facilities.